Herbert Ephraim Digby Hays, farmer, was born on 20 September 1869 at Forth, Tasmania, one of the twelve children of Frederick Henry Hays, a farmer, and Harriet Rebecca, née Digby. He was educated locally and took up farming as a young man. On 21 June 1900, Hays married Patience Elizabeth Mills, also born in Forth, the daughter of Alexander Rudd Mills, a farmer, and his wife, Annie Elizabeth, née Vertigan. The couple were married in Forth in accordance with the usages of the Wesleyan Methodist Church. They would have a son, Maurice, and a daughter, Dora. Hays’ involvement in politics began in local government with his membership of the Don Road Trust, which later became the Devonport Council. In 1907 he was elected to the Mersey Marine Board (Devonport), of which he remained a member until 1935. 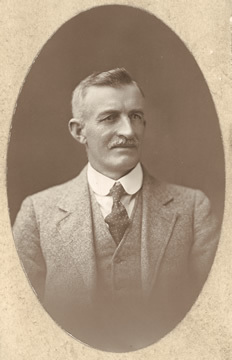 As a member of the Farmers’ and Stockowners’ Association, Hays was one of the founders of the Tasmanian Liberal League in 1909. In June 1911 he entered the House of Assembly for the seat of Wilmot at a by-election. The Examiner thought Hays would ‘make a good country representative, for he has the reputation of being shrewd and level-headed’. Another correspondent stated: ‘While Mr. Hays may not be a brilliant man, it is generally admitted that he is sound, and can be trusted to do his best in the interests of the state’. In Parliament, Hays spoke briefly, largely keeping to rural issues, such as contagious diseases in cattle, rural workers’ accommodation, wire-netting, railway refreshment rooms, potatoes, rabbits, daylight saving and also shipbuilding in Devonport. Hays was an effective local member, an advocate for the farmers and the north-west, and a loyal supporter of the Liberal cause. He was also an active participant in parliamentary life, serving on the Printing Committee (1911-16) and on select committees on interstate shipping (1912), deep-sea fisheries (1914), the proposed Bell Bay railway (1914–15) and new standing orders (1919–20). Hays believed in closer settlement and immigration as a means of state development. He supported government expenditure on infrastructure—though with due reference to economy. He also supported the establishment of a state farm, preferably conducted upon commercial lines. On the other hand, he was one of a small number of members—‘little Tasmanians’—who objected to the Government’s purchase of the hydro-electric scheme. Hays was an early advocate of conscription, and a consistent supporter of temperance measures, even advocating prohibition. Hays became an honorary minister in the Liberal (later Nationalist) Government of W. H. Lee in April 1916, his appointment seen as recognition of the claims of the north-west coast and an honour conferred ‘on a member who has gained the esteem of his party by his straightforwardness and loyal support’. During the prelude to the 1922 election, the Examiner said of Hays: ‘Wilmot owes a big debt to that gentleman. Virtually he has been “Minister for the North-West Coast”, and when his work in that capacity is recalled it should bring him hundreds of willing and thankful No. 1 votes’. However, the electoral situation had been complicated by the appearance of the Country Party, and the resultant split in the conservative vote led to Hays’ defeat. The Examiner was disgusted: ‘the North-West Coast has lost one of the best members it ever had, and without putting anyone in his place’. In December 1922 Hays, who by this time was on the council of the Nationalist Party in Tasmania, stood for election to the Senate. Distancing himself from the fading political fortunes of the Prime Minister, W. M. Hughes, he described himself as ‘a Nationalist, but not a Hughesite’, and promised that ‘if returned he would be out to get a fair deal for the state, regardless of whom he pleased or offended’. In particular he desired ‘a fairer deal for Tasmania in the matter of finance’. Hays topped the poll for the Nationalists, coming second overall to Labor’s J. E. Ogden, and defeating Senators Keating and Earle. The result took the Mercury by surprise but, according to the Examiner, Hays’ election would ‘give considerable pleasure to Nationalists, and to men who are keen on having as a representative one who knows the land and the needs of those that work it’. Entering the Senate in July 1923 he would serve the non-Labor cause, first as a Nationalist, then as a member of the United Australia Party, and finally as a Liberal. In both 1928 and 1934 he polled relatively poorly, but in 1940 topped the poll for the UAP in Tasmania. In the Senate, Hays served on a number of committees including the Joint Committee on Rural Industries. He was also Chairman of Committees from 1 September 1932 until 30 June 1935. In his first speech he set out Tasmania’s claim for special attention: ‘No other State in the Commonwealth made greater sacrifices than did Tasmania in entering the Federation’. Yet he argued that with ‘proper assistance in the initial stages, and that consideration which we have a right to expect from the National Parliament, I think that we shall be able to hold our own with the other States’. During the 1920s and 1930s, he urged the Commonwealth to assist in the development of oil shale deposits in Tasmania, and the production of paper pulp for newsprint. In 1944 he supported legislation to establish aluminium production in Tasmania. While he admitted he had no alternative but to vote for the Financial Agreement Bill of 1927, he declared that ‘we must come to the conclusion that in another fifteen years the States’ means of raising revenue will have been restricted to such an extent that little will remain of their sovereign rights as we know them to-day’. He was also critical of the early work of the Commonwealth Grants Commission. By 1938 he had reassessed the position: ‘Speaking in general terms, it can be said that the weaker States have received from the Commonwealth Grants Commission a substantial measure of justice which was long overdue’. Another of Hays’ principal concerns was the issue of transport and communications between Tasmania and the mainland, especially in regard to telephone services: ‘Every honorable senator realizes the value of a telephone service in business transactions, and the citizens of the Commonwealth who reside in my State should not be called upon much longer to suffer the real disability due to the absence of these facilities’. In 1923 he had urged senators to consider Tasmania’s position as ‘an island State, dependent entirely on shipping’. Like many Tasmanians, Hays believed that the Navigation Act had contributed considerably to ‘Tasmania’s difficulties’, and was delighted when the Government of Joseph Lyons overturned the Act in 1935. Then there were the perennial strikes that afflicted Australia’s maritime industries throughout the 1920s. ‘It cannot be doubted’, Hays told the Senate in 1925, ‘that Tasmanian producers lose a tremendous amount of money annually in consequence of these shipping strikes’. During the 1940s he vigorously questioned the allocation of shipping and air services to Tasmania. Hays seemed at his most parochial when dealing with issues affecting the farmers of his constituency. During the 1920s and 1930s he made repeated calls for financial assistance for apple and pear growers, and expressed reservations about providing support for bounties on meat, wine and cotton. In 1932 he rejected proposals to subsidise wheat. A low tariff man, in 1933 he attributed the problems of citrus growers to Australia’s high tariff policy. Finally, in debate upon the Customs Tariff Bill in June, Hays took a stand against the Lyons Government: ‘Now, because of the Government’s tremendously high tariff, farmers find it impossible to replace their old machinery with new articles, and almost as difficult to purchase spare parts, because of the prohibitive price that is asked for them’. By 1937 he had become an opponent of ‘economic nationalism’ and an advocate of free trade, who believed ‘that the proper function of a government is to govern, and not to trade’. Hays’ final years in the Senate were spent in opposition to the Curtin and Chifley governments with whose policies he found himself increasingly at odds, especially in relation to compulsory arbitration, to which he had long been irrevocably opposed. In 1946 he predicted Labor’s imminent defeat. In fact, he was himself defeated. Labor polled well in Tasmania in the September election and Hays relatively poorly. None of the Tasmanian Liberal candidates for the Senate were returned. Already nearing seventy-eight years of age, he lived out his retirement in Devonport. After leaving the Senate he again served on the Mersey Marine Board—from 1948 until his resignation in 1957. He died on 16 February 1960 at the Mersey General Hospital, survived by his wife and children. After a funeral service at Devonport Congregational Church, he was buried in the local cemetery. In the Senate Hays had not been a great parliamentary performer though, true to his electoral promise in 1922, he had retained some measure of independence, as the tariff issue proved. His long career, due in part to his ability to understand local politics, was characterised by modest achievement rather than shining success. He was a loyal foot soldier for the causes he cared most about—the farmers and Tasmania. Mercury (Hob. ), 17 Feb. 1960, p. 3; Examiner (Launc. ), 15 Apr. 1916, p. 7, 7 June 1944, p. 4, 12 June 1911, p. 4; P. Loveday, A. W. Martin and R. S. Parker (eds), The Emergence of the Australian Party System, Hale & Iremonger, Sydney, 1977, pp. 447–8; Mercury (Hob. ), 12 June 1911, p. 4. Mercury (Hob. ), 22 Dec. 1911, p. 8, 5 Dec. 1912, p. 7, 5 Sept. 1913, p. 6, 19 Sept. 1913, p. 7, 11 Dec. 1914, p. 7, 9 Apr. 1914, p. 7, 27 Jan. 1915, p. 6, 4 Oct. 1918, p. 7, 8 Nov. 1918, p. 8, 26 Nov. 1920, p. 6. Mercury (Hob. ), 18 Oct. 1911, p. 2, 11 July 1912, p. 6, 16 Oct. 1913, p. 7, 4 Dec. 1913, p. 7, 10 Dec. 1914, pp. 7-8, 27 Sept. 1912, p. 6, 2 Oct. 1913, p. 6, 9 July 1914, p. 6, 9 July 1915, p. 7, 26 Nov. 1915, p. 8, 3 Oct. 1918, p. 8, 8 Sept. 1921, p. 7; TPP, 1911-1922. Examiner (Launc. ), 15 Apr. 1916, p. 6; Mercury (Hob. ), 15 Apr. 1916, p. 9, 30 Oct. 1918, p. 7, 7 Nov. 1919, p. 3, 16 Oct. 1919, p. 6; Examiner (Launc. ), 7 June 1922, p. 4, 19 June 1922, p. 4; Mercury (Hob. ), 19 June 1922, p. 6. Examiner (Launc. ), 14 Dec. 1922, p. 5; Mercury (Hob. ), 11 Dec. 1922, p. 5, 26 Dec. 1922, p. 4; Examiner (Launc. ), 23 Dec. 1922, p. 5, 26 Dec. 1922, pp. 4, 5, 29 Nov. 1928, p. 7, 30 Nov. 1928, p. 6, 2 Oct. 1934, pp. 6, 7, 27 Sept. 1940, p. 5, 4 Oct. 1946, p. 5. CPD, 6 July 1923, p. 778, 9 Sept. 1925, pp. 2310-11, 4 Aug. 1926, p. 4842, 16 Oct. 1931, p. 995, 1 Dec. 1944, pp. 2561-4, 28 Mar. 1928, p. 4201, 16 Nov. 1938, p. 1493, 27 Nov. 1941, p. 1053. CPD, 7 June 1933, p. 2130, 6 July 1923, p. 783, 9 July 1925, p. 845, 4 Apr. 1935, p. 713, 16 Feb. 1944, p. 189, 20 July 1945, p. 4326, 25 July 1946, pp. 3041–2, 23 May 1947, p. 2833. CPD, 6 Aug. 1926, p. 4992, 9 Oct. 1936, p. 961, 22 Nov. 1938, pp. 1773-6, 26 May 1926, pp. 2293-4, 6 July 1923, p. 782, 31 July 1923, p. 1810, 4 Sept. 1924, pp. 3943-5, 13 Aug. 1926, p. 5472, 1 & 2 Dec. 1932, pp. 3397–400, 6 July 1933, p. 2933, 7 June 1933, p. 2133, 29 June 1937, p. 652, 5 Dec. 1939, p. 2012. CPD, 7 May 1947, pp. 1976–8, 24 July 1931, pp. 4393–5, 13 June 1928, p. 5947, 6 Aug. 1946, p. 3691; Examiner (Launc. ), 4 Oct. 1946, p. 5. Mercury (Hob. ), 17 Feb. 1960, p. 3. This biography was first published in The Biographical Dictionary of the Australian Senate, vol. 2, 1929-1962, Melbourne University Press, Carlton, Vic., 2004, pp. 186-189.